Three strong wins near the end of the match weren’t enough for the Cougars to roar back against Hampshire Wrestling as the Trojans muscled to a 50-17 victory at Sunrise Summit on Thursday night. 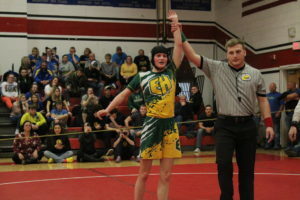 East Hardy Wrestling observed the initial match from the stands between Hampshire and Mountain Ridge from Maryland, then battled against the Trojans as the Miners only grappled in one match without facing the Cougars after a 50-15 win. “They’re a very good team. We wrestled hard, so I’m happy. We had a couple big wins towards the end that really picked things up for us. 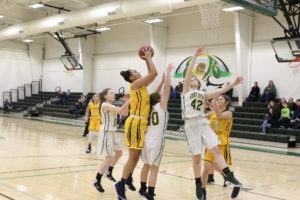 It put us back on the board, so I am happy with it,” East Hardy Coach Stevie Miller remarked. 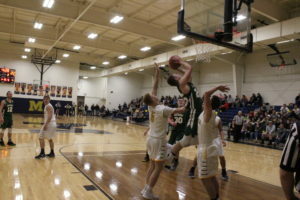 The match wins for East Hardy were created by junior Blake Miller and freshmen Sky Spell and Dayton Miller. East Hardy 138-lb. grappler Sky Spell was very aggressive and executed a 20-3 technical fall over Hampshire’s Bryan Armstrong just seconds before the third round buzzer sounded. Spell counted the first shooting attempt making a takedown for the initial points, then after rolling on the mat there was a whistle for blood time midway through the opening round. Spell managed a reversal and got an arm lock to put Armstrong on his back for additional points creating a 7-0 lead entering the second period. Armstrong countered the top-bottom position with a reversal, then Spell flipped over and did a cross-face move for back points prior to a penalty. The wrestlers rolled around to the outside line as time expired in the second period. Spell notched a double-leg takedown and earned double back points late in the third period with Armstrong making a reversal before the buzzer sounded. The referee indicated the match was over before the reversal due to the technical fall point difference, 20-3 giving Spell the victory. In the 145-lb. 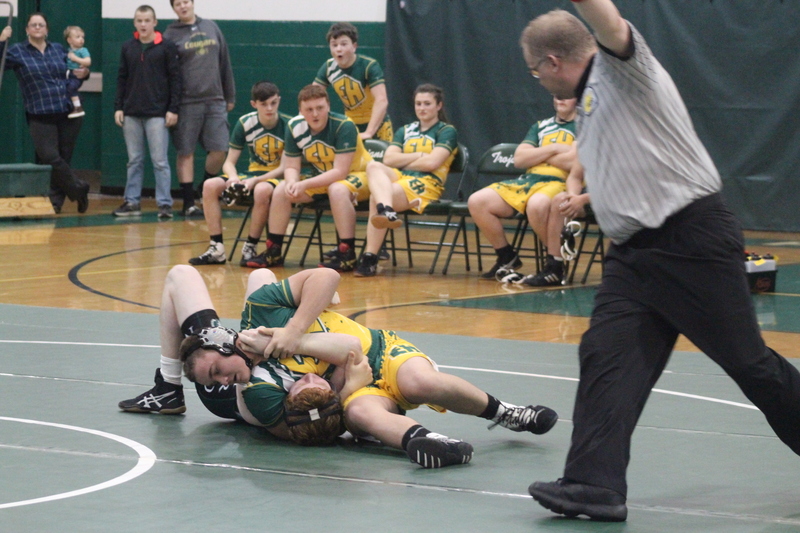 weight class, East Hardy’s Blake Miller needed less than one period to execute a pin over Hampshire’s Raymond Buckler. Buckler made a low shot which allowed Miller to grab hold on top, but Buckler managed to stand up to deliver a takedown and made back points. Miller executed a reversal and made a power half to create a better angle to turn and setup a pin with 28 seconds remaining in the first period. The Trojans added forfeit points before the final match of the night. East Hardy 160-lb. grappler Dayton Miller went into action against Hampshire’s Asbury Wade, shooting for a double-leg takedown and making an arm lock twist for a pin at the 1:21 mark of the first period. These were exciting matches to watch with the teammates and fans cheering the grapplers on the mat.